Our goal was to develop a non-profit organization centered around a social cause of our choice. A team consisting of Cara Bono and myself came up with the non-profit, BEEfore Extinction, to help educate people on the importance of honey bees and what our future could look like if they are gone. We created branding, a website, and an app, all focusing on our cause. For the branding, we wanted people to realize how serious the issue was without making it too doom and gloom. We landed on BEEfore Extinction as the name of our organization. The play on words made the organization inviting, while keeping the overall seriousness of the cause. The name also made sense because we wanted to educate the people on simple things they could do to prevent the extinction of bees. For our logo, we wanted to give it a simple modern look. We felt that the information on our website and app would be taken more seriously if our brand looked professional and clean. We made the overall logo mark an image of a geometric bee. The shape of the bee’s body mimics that of a honeycomb, a featured shape throughout our website. A simple outline of an hourglass is behind the bee, this is to symbolize the rapidly decreasing time bees have left on earth. We chose a simple, clean san serif as our logotype. We wanted it to match the geometric feel of the mark without overpowering it. Cara and I collected data from other non-profit companies focusing on sustainability and honey bees. We analyzed what was working and wasn’t working in their web designs to help us create our website. We wanted our website to not be super text heavy and wanted to make sure our app was super interactive. Imagery was important for our cause, most people don’t care about bees because of their harmful reputation. We wanted to show the beauty in nature that is possible because of bees. We chose colorful full screen images to draw viewers into the information. For the app, we wanted to give people a reason to download and use the data on their phone by making it interactive. 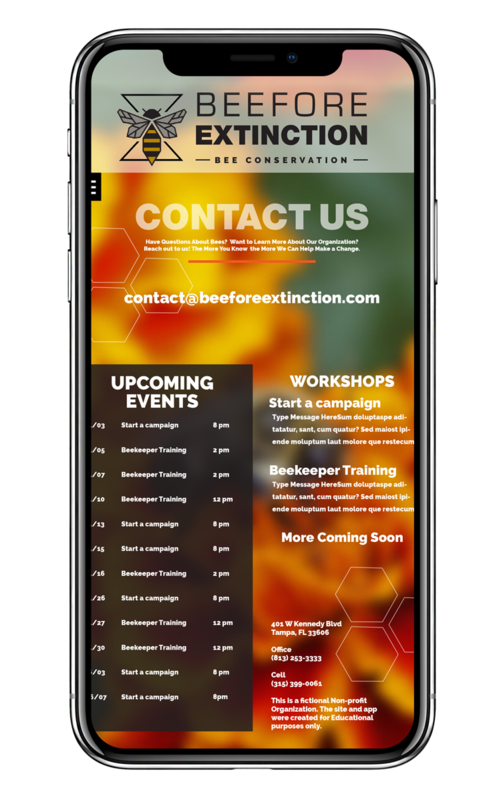 We broke down the app into four main sections: About Us, Bee Benefits, Areas at Risk, and Contact Us. About Us goes over who our non-profit is and ways to become a member. It also breaks down the hierarchy of a bee colony and gives more information on different types of honey bees and their roles. Bee Benefits contains detailed information on four specific benefits bees provide to the ecosystem. Areas at Risk shows an interactive map of the United States where you can click on a pinpointed city and review the threat to bees in that area. Finally, the Contact page gives users contact information to get more involved with our organization, as well as a calendar with events and workshops related to the cause.